Your email list is kind of a big deal. The increased use of ad blockers, spam filters, and an overall increase in marketing messages all the time on every device means communicating with customers and prospects is becoming more difficult. One solution to combat this challenge is to make building a quality email list an important part of your marketing strategy. 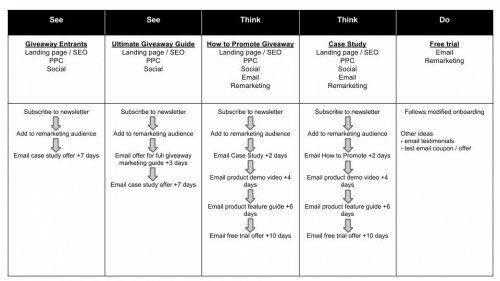 Here’s how we grew our email list to 35,000 using giveaways. Create a lot of quality content on your blog? Put a subscription link on your blog and/or website. Create an interactive piece of content that is valuable to the types of customers you’re looking for. Write an eBook that the types of customers you want will find valuable. In our case, we wrote an eBook on running a successful giveaway. You can see in the chart below that running giveaways has helped us grow our list from zero to 35,000. Email providers have gotten very sophisticated and there are plenty of vendors out there to suit every feature you might need as well as price point. Which vendor is right for you will depend on your individual business needs and budget. Do not, I repeat, do not send marketing emails from your individual personal or business account! All of our giveaway entries go into a Mailchimp account. 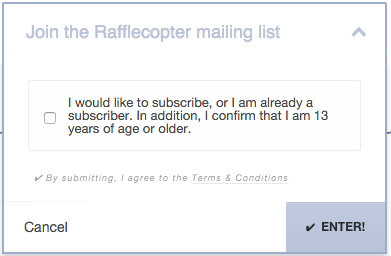 Here’s a list of email providers integrated with Rafflecopter. In addition to the steps below, we’ve put together several resources you can use to create your giveaway, including a giveaway launch checklist, a giveaway Field Manual, and video tutorials. 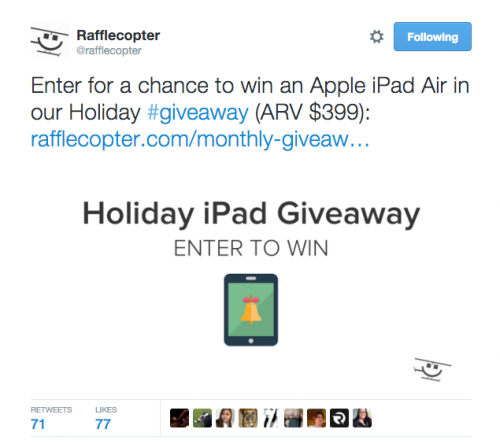 Creating a successful giveaway heavily depends on selecting the right prize. It’s important to choose a prize that is relevant to your prospective audience plus has a high enough value to generate interest and demand. In our case, every entrant’s email address for this option is sent to our Mailchimp account plus an explicit opt-in by the subscriber is handled right on the entry option. Anytime we talk about email it’s worth mentioning the CAN-SPAM act (or whatever digital communication laws are applicable for your country). The bottom line is you want to be awesome at customer communications and abiding by the digital communications law in your country should be the absolute minimum thing you do. 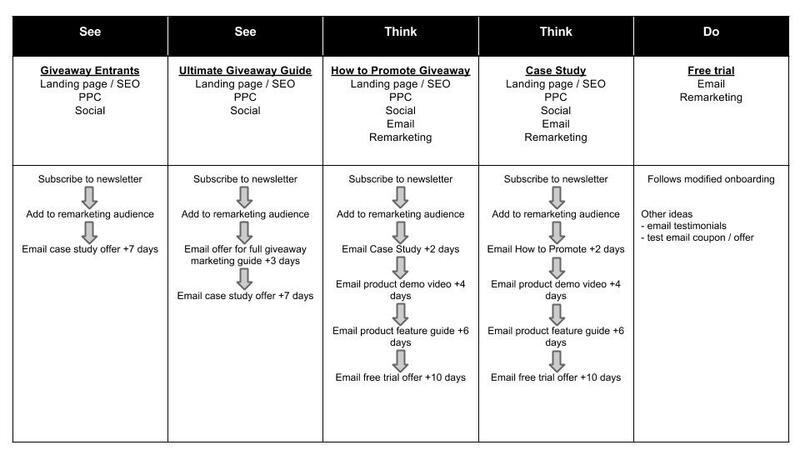 In addition to an email entry option, it’s worth considering other entry types to help increase the effectiveness of your giveaway. Tweet a message: If Twitter is a channel your customers and prospects are on, consider including an entry option to tweet a message. This is a great way to increase exposure for your giveaway by getting it in front of your entrants followers. For maximum awesomeness include hashtags. Follow on Twitter or Pinterest: This option can be a stepping stone for entrants who maybe aren’t ready to join your email list. A strong following on social media can be a great way to grow your email list by sharing content that’s valuable to your followers, and occasionally tweeting about your list. Include a Refer-A-Friend option: Another way to take advantage of your entrants social circles in addition to tweeting a message is to include a refer-a-friend option. 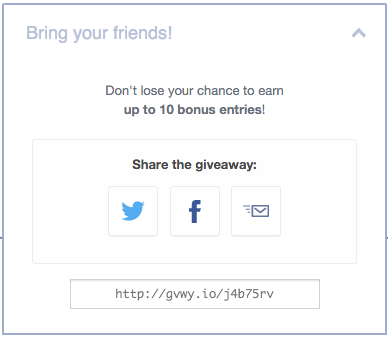 This option incentivizes entrants to share your giveaway by receiving additional entries when additional people enter the giveaway through their unique URL. Building an email list isn’t a one time event. It’s a process that takes time and requires work which is why having a consistent focus will yield benefits over the long term. We’ve been running giveaways as a part of our email list building strategy for a few years and that’s a major factor in the success we’ve experienced growing our list. We’ve put together a few ideas to help you develop an email building strategy with giveaways through the Spring, Summer and holidays. Building an email list doesn’t do you much good if as many people are unsubscribing as are subscribing. Your job isn’t done once someone signs up for your email list. There also needs to be a constant focus on sending high quality content to the list. Know who you’re talking to: Take the time to really understand who your customers and prospects are. Send the right content: Once you know who you’re talking to, this should help you determine the right content to send. At the right time: Website visitors arrive at your site during different stages in their relationship with you, so treat them that way in when you deliver messages to them. To the right place: While email is the primary channel most companies use to communicate with their customers and prospects, it’s worth considering if other channels are appropriate for your business. Give people a choice: Let your customers and prospects determine how frequently you communicate with them. Now it’s your turn. 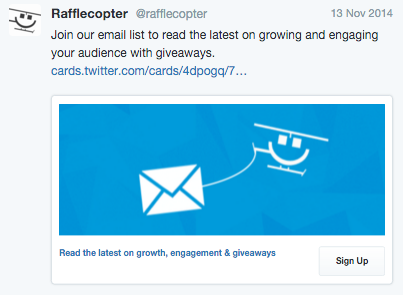 Have you used a giveaway to build your email list? What challenges did you have? What success did you experience? Let us know in the comments below! …but failed to give any reasons. One might be that you might not be sure if your own domain host lets you send as many emails as you add to your email client’s TO-field in one go. Worst case here would be if the sending of your messages stops at a certain point and leaves you to work out for yourself who did get the message and who didn’t. Hey Christian, thanks for the question! There are a few reasons (and to clarify, I’m referring to sending out marketing and transactional emails to your database). 1. Sending in bulk from your personal or business account could get you labeled as a spammer from your email provider. If this happens, it’s possible that everyone in your organization wouldn’t be able to send an email without it getting flagged as spam. It’s also possible your account could be suspended. 2. There are no analytics available when sending from a personal or business account which leaves you blind as to how the campaign is performing when it comes to open rates, click thru rates, etc. 3. Most email marketing systems have tools available that allow you to personalize at scale. Even something as basic as including the recipients first name in the subject line or salutation can improve engagement and performance. Sending 10, 100, 1000 emails from a personal or business account means either using a generic “Hi there!” or customizing each email one at a time. Those are just a few and hope that helps!